Above, an image of the cover of one of two autograph albums that belonged to Mary Elizabeth Bechly of Searsboro, Iowa. See the other album here. As you can see below, Mary used several spellings of her surname on the two different albums: Bechly, Beckly and Beckley. Her father was born in Germany, and the original name may actually have been something else. 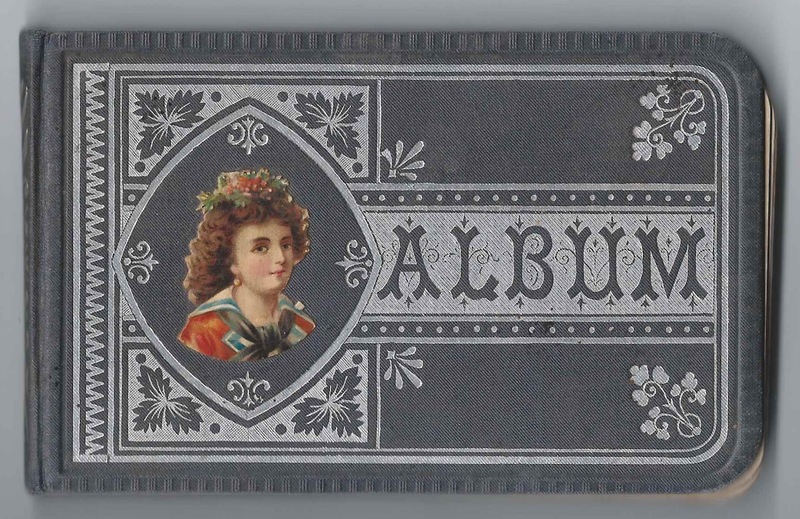 The album is approximately 5-1/4" x 3-1/4" and contains the sentiments of 53 of Mary's relatives, friends and schoolmates. An alphabetical surname list and an alphabetical list of the signers, together with any personal information or family relationship they offered, appear at the end of this post. Hepzibah died less than a year after Mary's birth. Freidrich, or Fred, then married Lydia Maria Weesner, some of whose relatives signed pages in the albums. Mary had a full brother, Frederick William Bechly and, I think, six younger half-siblings. Mary's mother Hepzibah (Dumville) Bechly had three siblings, brother William and sisters Elizabeth and Jemima. Elizabeth Dumville married John W. Williams in 1846. They and their family were living in Washington, D.C., at the time of the 1880 Census. 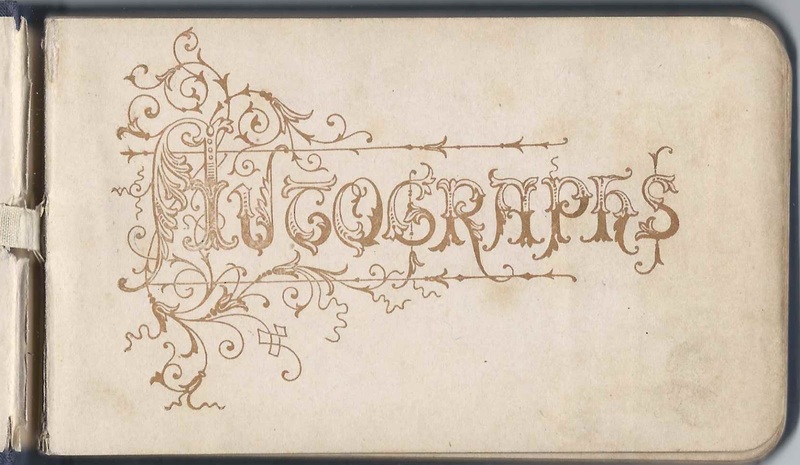 Son George Thomas Williams signed a page in this album at Grinnell, Iowa, on December 25, 1881. He also signed a page in the other album. Mary, signed at Grinnell, Iowa, on December 27, 1881; Mary's cousin. Adda Beaderstat, signed at Searsboro, Iowa, on December 9, 1881. Perhaps Ada Beaderstadt. 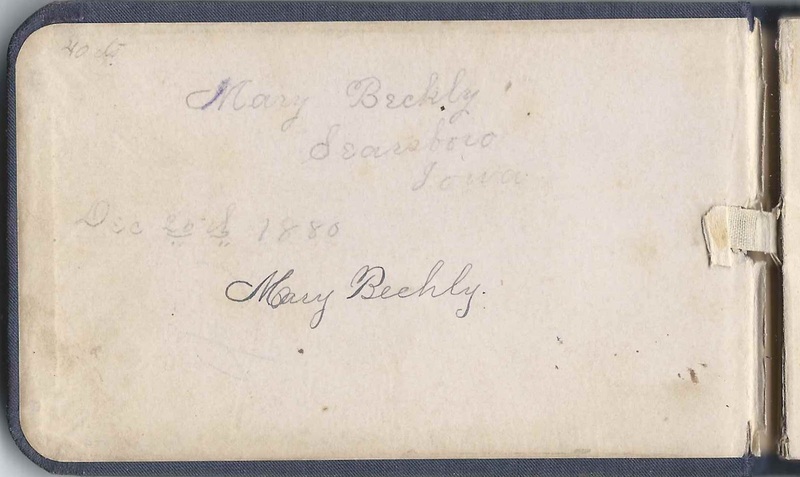 Mary Bechly of Searsboro, Iowa; dated December 25, 1880; presumably she received the album as a Christmas present. She spelled her name in two places on the inside front cover, once as Beckly and again as Bechly. It was likely pronounced "Beckly", but was the family name was Bechly. Jennie Binnegar of Searsboro, Iowa, signed on December 12, 1883. Records show her as Jennie Binegar. Charlie Bingor, signed on December 12, 1883. Presumably Charles Binegar. Lucy Binnegar of Searsboro, Iowa, signed on January 4, 1884. On another page in this album, she signed her name as Lucy Binegar. Loeza Carr, signed at Searsboro, Iowa, on "8-9". She signed her name on another page in this album and in Mary's other album as Loueza Carr. Loueza Carr, signed at Searsboro, Iowa, on December 8, 1883. She signed another page in this album as well. E. D. Holme of Savannah, Missouri. Presumably Dr. Edward Dumville Holme, son of James Henry Holme and Jemima (Dumville) Holme, who was a sister to Mary's mother Hepzibah Beulah (Dumville) Bechly. Carrie Latham, signed at Searsboro, Iowa, on December 9, 1881. Presumably the daughter of Joel Elisha Latham and Phoebe Flora (Phillips) Latham. Joel's brother Melville Amos Latham was married to Margaret Emily (Williams) Latham, daughter Elizabeth (Dumville) Williams, a sister to Mary's mother. Dell Mann, signed on March 5, 1886 at Searsboro, Iowa. Presumably Delia Mann, daughter of Franklin and Electa (Willard) Mann. Her younger sister Winnie Mann signed the right facing page. Winnie Mann of Searsboro, Iowa, signed on December 4, 1883; Mary's schoolmate. Winnie's older sister Dell Mann signed the left facing page. Teenie Moderwell, signed at Ladora, Iowa, on February 25, 1888. Presumably Christina Moderwell, daughter of Robert and Adella (Arnold) Moderwell. Maggie Morriss or Morrissey, signed on December 6, 1883. Surname runs off the page. J. W. Reece - name written on a scrap of paper. W. D. Taylor, signed at Searsboro, Iowa, on December 13, 1883. William Weesner, signed at Searsboro, Iowa, on January 18, 1885. Perhaps William Rufus Weesner, the brother of Mary's father's second wife Lydia Mariah (Weesner) Bechly. 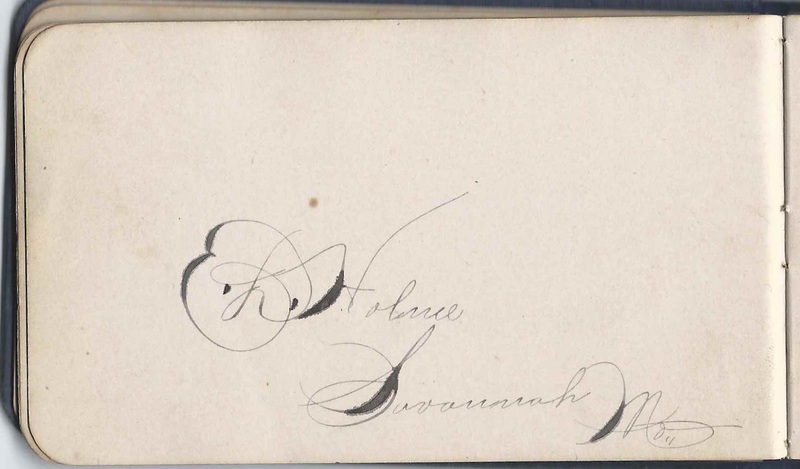 Perhaps the Ella Weesner who signed another page was his wife Sarah Ellen (Carns) Weesner. Ella Weesner, signed at Searsboro, Iowa, on January 18, 1885. Perhaps Sarah Ellen (Carns) Weesner, wife of signer William Weesner. 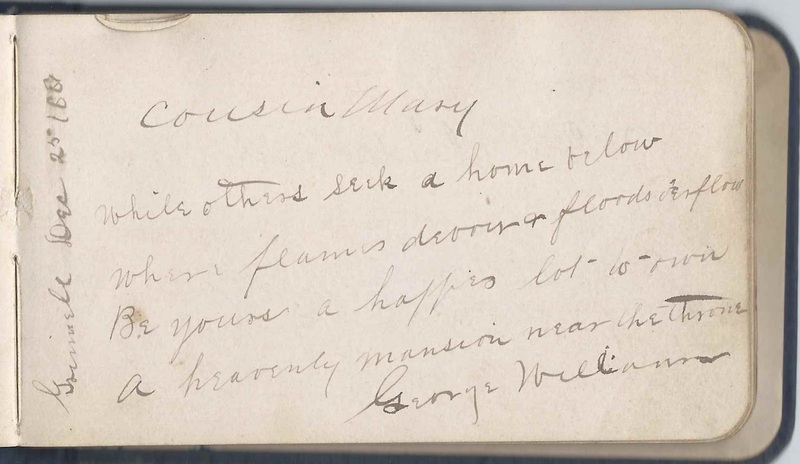 George Williams, signed at Grinnell, Iowa, on December 25, 1881; Mary's cousin George Thomas Williams, son of John W. Williams and Elizabeth (Dumville) Williams, sister of Mary's mother Hepzibah Beulah (Dumville) Bechly.